Having a bad luck? Fed up with problems? Negative events are ghosting you all the time? THERE IS THE WAY OUT! 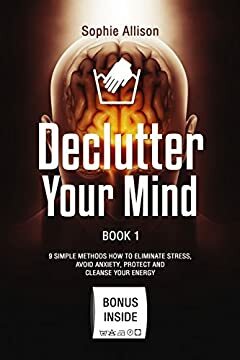 Today only discover â€œDeclutter Your Mind. 9 Steps to Eliminate Stress, Avoid Anxiety, Protect and Cleanse Your Energy. Mindfulness Book for Simplifying Your Life. A Guide to Hapinessâ€ by Sophie Allison, get this Kindle book for just $0.99. Regularly priced at $7.99. Read on your PC, Mac, smart phone, tablet or Kindle device. You can protect yourself, your home and your loved ones using the methods described in the book. And remember, by purchasing this book, you get your personal protection, wealth and health. Mantra Symbol Kutagara Sutra â€“ is one of the most influential and powerful Mantras created in the name of the man to assist him. Its cleansing properties kept under three locks from ordinary people for very long time.